Heat grill to medium-high. On a small bowl, combine the vinegar, ginger, thyme, 3 tablespoons of the oil, and ¼ teaspoon each salt and pepper. Set aside. In a large bowl, gently toss the onions, peaches remaining 1 tablespoon oil, ½ teaspoon salt, and ¼ teaspoon pepper. 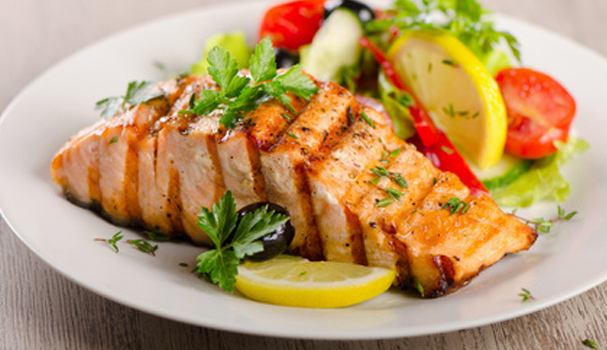 Grill the salmon and onions until salmon is opaque throughout and onions aretender, 5 to 6 minutes per side. After flipping the salmon, place the peaches on the grill and cook until tender, 3 to 4 minutes per side. Drizzle the salmon with the balsamic white vinegar and serve with the onionsand peaches.